Facebook's announcement, whatever it may be, will come about a week after Google+ was announced. Earlier this week, CEO Mark Zuckerberg said FB would "launch something awesome"
(CNN) -- We're sure it's a coincidence that we got this e-mail while we were setting up our Google+ profiles. Just days after the search giant rolled out its new networking platform, Facebook, the reigning champs of the social space, announced Friday that it will hold a news event next Wednesday. 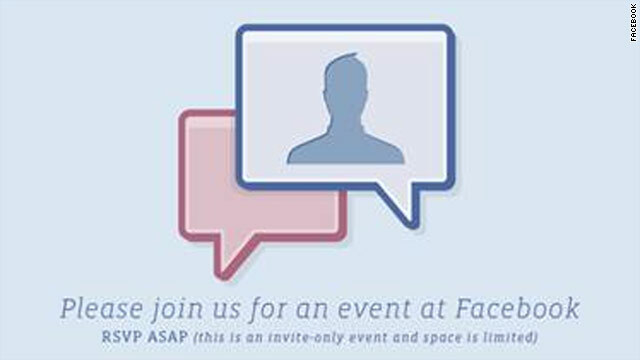 Facebook didn't provide any details in an e-mail inviting media members to the event, to be held at its Palo Alto, California, headquarters. But, on Wednesday, CEO Mark Zuckerberg promised that Facebook would "launch something awesome" next week. Zuckerberg was touring Facebook's engineering site in Seattle and wouldn't give many details, only saying that the announcement would be about something developed there. By late Friday, the leading theory was that the company will unveil a video-chat feature powered by Skype. CNN content partner Mashable was quoting unnamed sources they said confirmed the plan, which was first reported by blog Tech Crunch. Facebook and Skype already have a deep partnership, with Facebook content being integrated onto Skype clients. When Microsoft bought Skype in May, CEO Steve Ballmer mentioned "social" as one of the company's plans for it. We speculated at the time that Facebook integration might be in the works. Microsoft actually owns a piece of Facebook, having bought in for $240 million in 2007. Adding video chat would be an answer of sorts to Google+. Video chat is one of the features many reviewers have mentioned that set Google's upstart offering apart from Facebook. Other possibilities, should the video chat rumor turn out to be a red herring? Leading contenders include a long-awaited Facebook app for the iPad and a mobile photo-sharing tool. A photo-sharing app would put the social-media giant in competition with a slew of startups, like Instagram, Picplz and Path, that have sprung up in the past year. A couple of weeks back, TechCrunch published what it said appeared to be leaked images from a photo-sharing Facebook app for the iPhone. Facebook's Seattle campus is known to work on mobile projects, so that could be a hint in that direction. There also have been reports, including by Nick Bilton of The New York Times, that Facebook will finally be rolling out an iPad app. Would that be enough to earn an "awesome" tag from Zuckerberg? Maybe. But we'd love to see more than an announcement about an app for a device that's been out for almost a year and a half. It's hard to imagine the timing of the announcement is random. Since it was launched Tuesday for a limited number of tech journalists, bloggers and others, Google+ has been getting all the online buzz in the social-media world. To be sure, the handful of users Google has allowed a peek under the hood is digital light years away from Facebook's 600 million or so users worldwide. But after Buzz, Wave and other failed efforts, this looks like Google's most serious leap yet into the social-networking world. And that could mean, as competing smartphone makers discovered with Google's potent Android system, that Facebook has a real rival on its hands.